We will do our best to see genuine emergencies within 24 hours. Please telephone the practice first thing in the morning (8.45am) to arrange an appointment. 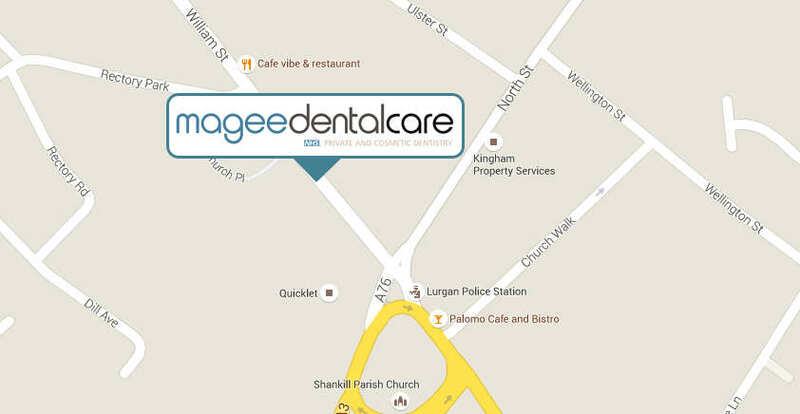 In the evenings, weekends and public holidays we participate in the Local Area Emergency Dental Clinic held in Craigavon Area Hospital every evening from 7pm until 9pm. There are additional sessions each Saturday and Sunday morning (and during selected holiday periods) from 10am until 12noon. If you normally pay for your dental treatment there is a charge at this Clinic. If you have pain without facial swelling you can purchase painkillers from any chemist. Always take the advice of the pharmacist and ensure to inform them of any current medication or medical conditions eg. asthma, stomach ulcers that you may have. Avoid hot/cold/hard foods as this may make the pain severe. Contact your dentist for treatment. If you are swollen it is often a sign of abscess or infection. If the swelling is severe or you feel sick, have a temperature or the swelling is affecting your swallow or breathing, you must attend your local casualty department urgently. Do not replace the crown with super glue. If the crown is at the back of your mouth leave it out and keep in a safe place until you attend your dentist. If the crown is at the front of your mouth you can buy temporary cement from some chemists. It is not advisable to eat or sleep with the crown retained by a temporary cement. Keep the piece carefully as it may be possible to repair the denture using the existing fragments. It may be necessary for the dentist to take an impression and send the broken denture to a laboratory for repair. If the socket is just oozing gently with blood apply pressure to the socket for 15-20 minutes. Use a clean handkerchief/gauze to form a firm pad. Place this over the socket and bite as firmly as possible for 15-20 minutes. If the socket is bleeding heavily or persistently you need urgent attention. Apply pressure to the socket as mentioned above and attend the local casualty department. What to do if you have a broken tooth. If the broken tooth is as a result of a fall or trauma and you are concerned about other injuries, go immediately to the hospital casualty department. If the tooth is broken while eating or the result of a lost filling, the tooth may have sharp edges that cut into the tongue or cheeks. It may also be sensitive to hot and cold. Avoid food/drinks that make the discomfort worse. Some chemists have temporary filling pastes that can be placed in the broken tooth to reduce the pain and irritation. DO NOT re-implant first (baby) teeth. Hold the tooth by the crown, not the pointed root. Do NOT scrub or touch the root – rinse the tooth with water or milk. Gently push the tooth back into the socket – make sure it is the correct way round. Bite on a clean hanky to hold the tooth in place. If you can’t put the tooth back in, place it in a cup of milk – don’t let it dry out.